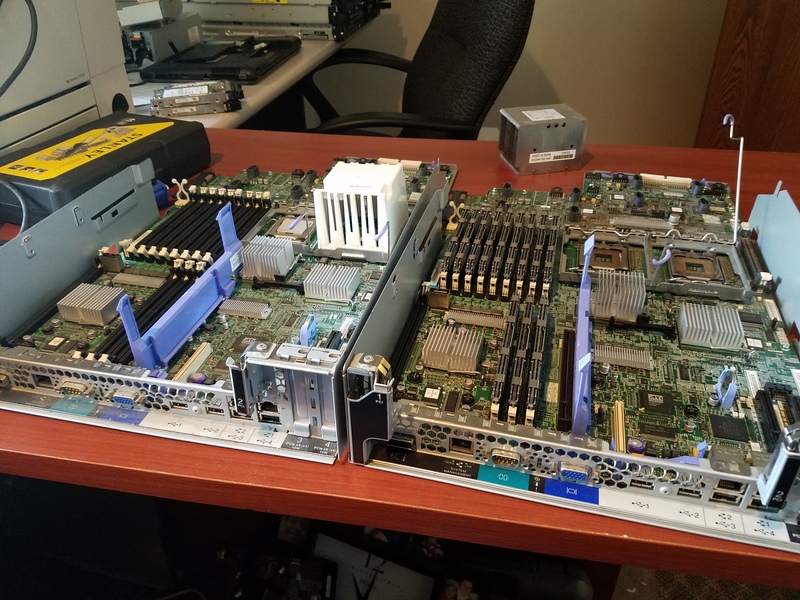 For those of you who may have followed along on my original post of me troubleshooting of an IBM X3650, I found a system planar for $20 (lol). Just arrived today, with shuttle, which is awesome. I’ll be putting this in the server chassis today and hopefully getting a successful boot. Left is the new board and right is the old. After being out of the office with other tasks, I finally had some time this morning to get this swapped out. Everything went well with the exception of the memory. I had to put in 2x1GB sticks in DIMM slots 1 and 4 as the previously installed 4GB modules were not working and I was finally able to get a POST. The BIOS at post is 1.03 and ServeRAID 8k-l initialized. I do need to update the BIOS as well as ServeRAID BIOS. The board I swapped from was at BIOS 1.19 and ServeRAID BIOS was at 17003.